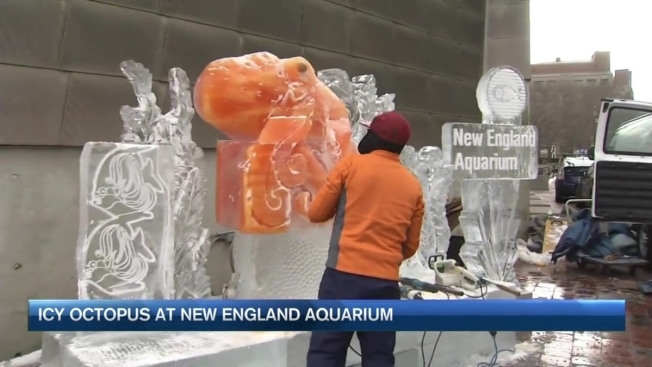 An ice sculpture of a giant octopus is on display outside the New England Aquarium. Don Chapelle, an ice sculptor from North Andover, put the finishing touches on the icy octopus Wednesday morning for Boston's First Night celebration. Chapelle did the majority of the work last week in his Lawrence, Massachusetts studio, where he carved the octopus's head and tentacles out of 50 blocks of ice. Each block if ice weighs 325 pounds, totaling 15-thousand pounds. Chapelle then moved the sculture to the Aquarium plaza and put it all together. The octopus ice sculpture is on display for public viewing.